I remember the pie line-up my Grandma had every Thanksgiving. I wanted to replicate that this year. I did fairly well..I mean I made rhubarb, pumpkin, a deep-dish pecan, a pumpkin cheesecake, and this french silk pie. Yes, I went a wee overboard. I am well aware of that. But my Grandma always bought one from Perkins restaurant. It is so rich. Creamy. Delicious. With those chocolate shavings on top. 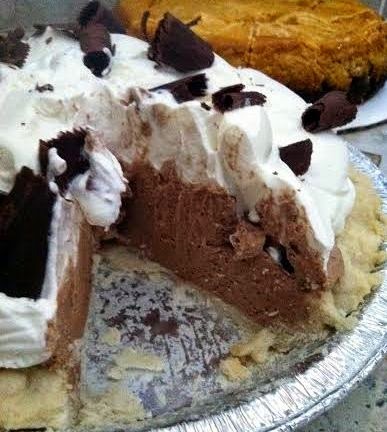 Now of course I have made the "no-bake" pudding chocolate pie before with a tub of cool-whip. But this year I wanted to make one from scratch...and guess what? It is just as easy as making all that pudding. I swear. Seriously, this is super simple. It just takes a bit of planning to allow time for the whipping and chilling of the pie. You could use a graham cracker crust, or a cookie crust, but I opted to go full "resturant-style" and use a real pastry pie shell. This recipe makes one HEAPING French Silk pie. I honestly can create two pies from this. So either cut it half from the start, make 2 pies, or just go ahead and pie that crust a mile-high! To make the filling melt the chocolate in the microwave or over a low heat on the stove. Beat the butter for a minute or two to fluff a bit. Add the sugar to the butter and beat for 5 more minutes, it should get more fluffy. You will need to scrap the sides of the bowl down a few times. Add the chocolate to the butter mixture and mix until completely incorporated. Add 2 of the eggs and beat for 3-4 minutes. Add the 3rd egg and beat for another 3-4 minutes. 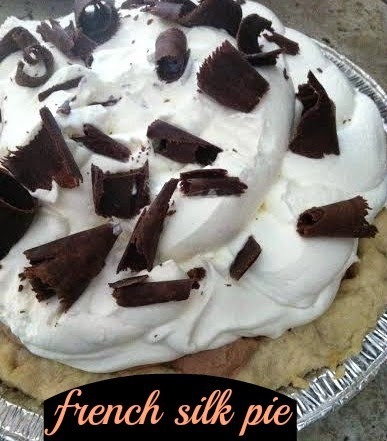 The chocolate will start to look silky, hence French Silk. In a clean bowl whip the 1 cup heavy whipping cream and 1 tablespoon powdered sugar until it begins to hold soft peaks. Fold the whipped cream into the chocolate mix until there are not white streaks left. Cover and store in the refrigerator for at least 12 hours. Whip the 2 cups heavy cream, powdered sugar, vanilla and almond extracts together until it forms stiff peaks. Soft peaks will not hold well when serving, don't over whip. Pipe or spoon over the chocolate pie. Garnish with chocolate curls or cocoa powder.